A Melbourne company has ambitious plans to revolutionise the bottled water industry – by making bottled water free. 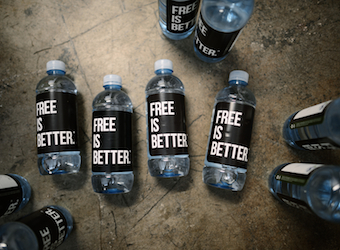 The new brand, Free Is Better, only hit the streets across Melbourne in late 2013, but has a goal of wiping out the existing bottled water market. “Our vision is to ultimately change the bottled water industry,” marketing director Hwi So tells Marketing Magazine. Free Is Better works in the exact same way – by selling the label space on its bottles to advertisers, at high enough rates to eliminate production and logistical costs, thereby passing the product onto the consumer for free, and scoring a tidy profit. The brand has yet to find shelf space next to the established supermarket brands. For the moment, it is targeting a small gen-y audience of “forward thinking, innovative trendsetters”, stocking in designer boutiques and partnering with creative industry events. Whether it will knock out existing competition is yet to be seen. Both high costs and environmental concerns that come with bottled water have plagued the industry in recent years, leading to a push back towards tap water. Like others on the market, Free Is Better, looks to minimise its impact on the environment by using bio-degradable plastics. But wouldn’t free bottled water only create further disposability of plastic bottles and encourage wastage?